Snapy Halo (ARG), bred and raced in Argentina, is a handsome 16.1 hands bay/brown. Snapy Halo proved to be one of the best of his generation, appearing 12 times for six wins from 1000m to 1600m. In a strong finish to his Argentinian racing career, he won his last three outings, appearance in two open handicaps at 1200m (in 1:8.16) and 1400m (by 2.5 lengths,1:20.58) and finally the Group 1 Estrellas Mile, winning that event by three lengths in 1.32.49. Snapy Halo’s extra quick turn of foot has been a quality of a preponderance of the runners by his sire Southern Halo, a son of the very influential Halo, a relation of Northern Dancer and Danehill. Nine times leading sire in Argentina, Southern Halo has 995 winners (over 70% of his runners) of 3029 races. They have won in all the South American countries and also in North America, Great Britain, Ireland, Singapore, Hong Kong and Japan. 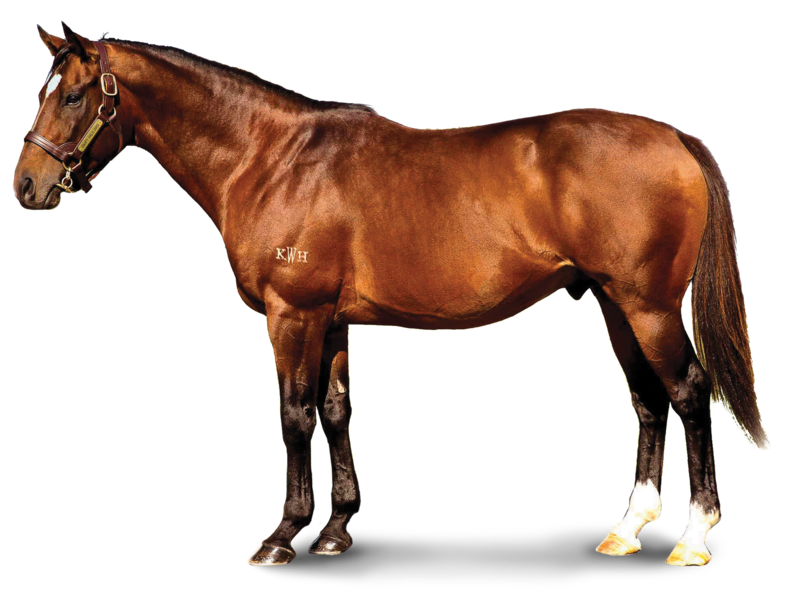 Southern Halo was Argentina’s leading sire from 1994-2000, plus 2004 & 2007 and has produced over 167 stakes-winners (including 50 Gr1-winners, 19 of them champions). Also, his daughters include 25 Group 1 winners and seven champions among their progeny to date. Four of Southern Halo’s Group 1 winners are More Than Ready, Snapy Halo, his brother Sebi Halo (eight wins at 1000m) and their sister Halo Ola (won three Group 1s and placed in four others). The latter three were from the good Argentinian sprinter Esnaola, a mare who had all her eight foals win and six earn black type. Snapy Halo’s Gr3-winning dam Esnaola has produced 3 individual Gr1-winners (plus 3 other stakes-placed runners from just 9 foals). Esnaolo’s sire, Ringaro, a stakes winning juvenile on New York’s Belmont Park, is by Caro, one of the major influences from the Grey Sovereign male line, followed up quality success as a source off winners in Argentina by becoming a force as a broodmare sire. So far his daughters have produced 15 Group 1 winners. The immediate family of Snapy Halo has been a consistent source of good horses. In fact, there are ninety black type earners (53 winners, 37 stakes placed) under his first four dams. The winners include 19 successful in Group 1 races, seven of them in South Africa and the high class European performer Rio de la Plata (Group 1 winner France and Italy; second French Two Thousand Guineas, Curragh National Stakes). Among the Group 1 collection have been Tex Fina (Horse of the Year Peru), Tucson (Champion Miler Peru), Evidencia (Champion Mare Argentina), Empress Club (Horse of the Year South Africa), Ecurie (Champion 2YO Filly South Africa), Esperada (Champion 2YO Filly Argentina) and Estambul (Champion Sprinter Argentina).